Hunting for a particle respirator mask right now after my wife reminded me to take care of my lungs. Painting model kits is toxic even if you are doing it outside. Enamel and Lacquer paints are toxic when you inhale them, they say that only the acrylic-water based paints are safe to inhale. Special emphasis on the "acrylic-water based", there is the spray paint acrylic for cars and those things are different from each other with the latter being toxic. Then again I wouldn't want to gamble with water based acrylics being safe either, because they could say "oops, we made a mistake" 20 years down the road. Right now I paint my kits while wearing wrap around safety goggles and me holding my breath... yeah it doesn't work as much because there is still the fumes that are hanging around the air after you spray the part. I'm thinking of getting a respirator from 3M because of the quality and the price seems affordable. Aside from the mask, I'd recommend also some safety goggles to protect your eyes from the paint-laden spray. 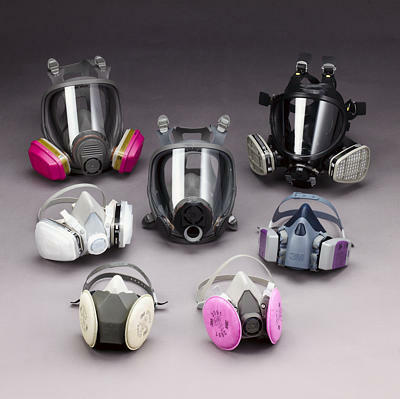 You could skip the goggles if you are planning to get a full face mask. Since I already have safety goggles I can afford to just buy the half-face mask type of respirator.